What exactly is Floridian cuisine, and is it any good? Key West is not, as it sounds, the newest addition to Kanye’s family. 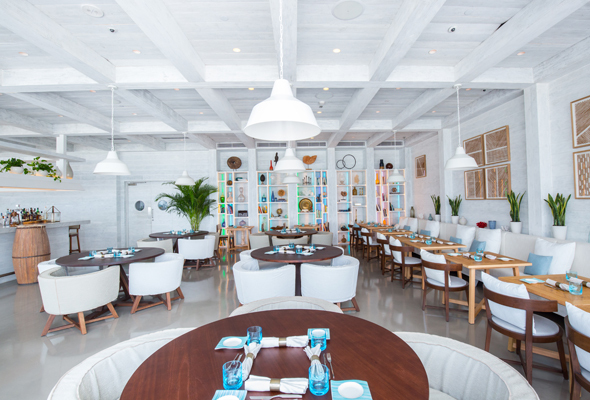 No, this island is part of the Florida Keys, with cuisine influenced by Florida, Latin America and the Caribbean. And that’s exactly what you’ll find at the new restaurant at Nikki Beach Resort & Spa Dubai. With its white-washed ceilings, natural wooden furniture and turquoise accents, the outlet feels like a high-end beach hut, especially with the sea views from its terrace (we predict it will be buzzing when alfresco dining season comes back). While we read the menu, the waiter brought over a tasty coconut and turmeric loaf to nibble; warm from the oven with a crust that Merry Berry herself would be impressed by. But don’t fill up on bread now – there’s too much good stuff here to try. Just dive in and try a bit of everything. The lobster mac and cheese tots (Dhs80) were crisp parcels generously filled with tender lobster, a gooey mix of gruyere and sharp cheddar, paired with a smoked tomato and fennel seed ketchup. The Key West seafood sliders (Dhs75) contained a perfectly-cooked helping of blackened fish with Old Bay aioli, but were a bit too bread heavy. A highlight was the sea bass ceviche (Dhs80), which our date deemed “the best ceviche I’ve ever tried in Dubai” – a lofty claim if ever we heard one. We also recommend ordering the salted pretzel sticks (Dhs45), purely for the addictive blue cheese dip they were served with. Speaking of sauces, the homemade hot sauces were fiery. 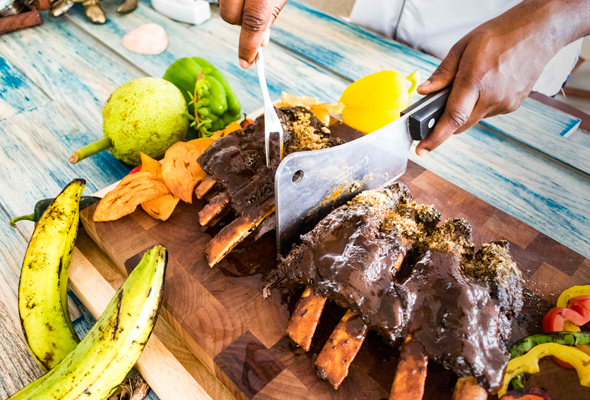 The creation of chef Olivier Hilton, who hails from St Lucia, there were three levels of spiciness, ranging from the sweet Sugar & Spice to the blazing Qualibou, named aptly after a volcano. The sauces themselves are called Henrietta’s Hot Sauce, after Olivier’s beloved late grandmother. For mains, the BBQ spare ribs (Dhs165 for a half rack, Dhs320 for a full rack) was a meaty feast, with a finger-licking smoky glaze. The jerk chicken drumsticks (Dhs75) were a slightly lighter option, and we loved the creamy ranch dressing they were served with. If you have any room at all for dessert, go for the classic Key West Key Lime (Dhs55). We’ll bet our last dirhams that the presentation alone will put this sweet treat all over your social media feeds soon. Instead of a bowl, we got a hollowed-out bottle, with a chocolate scroll message inside, surrounded by sugar-for-sand and seashells. The dessert itself was a mix of tangy citrus custard, melt-in-the-mouth yuzu pearls, creamy meringue and light sponge cake, and was as tasty as it was photogenic. It alone would be reason enough to return.